Out of sight, out of mind when it comes to remote workers? Not with Alex Santo. He brings an unmistakable voice to Brafton’s editorial team. Originally from Minnesota, Alex grew up in a small town called Centerville. Life revolved around fishing, snowmobiling, camping and spending countless days on his grandparents’ dairy farm. When it was time to go to college, Alex chose to study English at the University of Minnesota. Alex was quick to collect stamps in his passport, heading to Edinburgh in 2011 for a creative writing seminar. Spoiler alert: This is where he met his future wife. Six years later, “we got hitched at a courthouse,” Alex said. Before working for Brafton, Alex spent two years living and teaching English in Zhengzhou, China. As a city home to about 10 million people, Zhengzhou is a relatively small town in Chinese terms. “My co-workers and I eventually got really good at ordering peanut noodles,” Alex said. However, when he moved to Beijing, he had some work to do on his Chinese. Along with indulging in plenty of peanut noodles, Alex also worked for a mobile games publisher during his time in China. The job called for writing flavor text for games, brainstorming English titles for products and consulting on new properties. “I was the only foreigner working for the company, so it really accelerated my language learning,” Alex said. While abroad, Alex visited Seoul, Hong Kong, Macau, Tianjin, Phuket, Bangkok and Istanbul. Needless to say, he’s a fan of visiting new destinations. Fast forward to today and Alex continues to add stamps to his passport – now with his wife by his side. 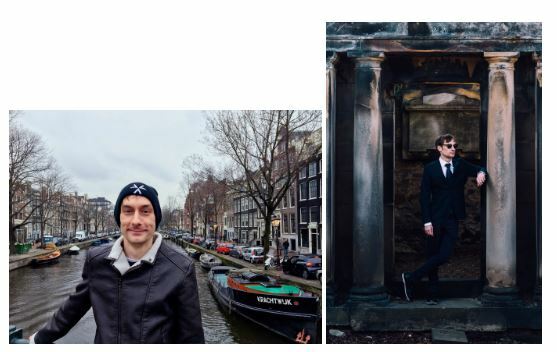 Here he is on their recent tour of Europe, hitting Edinburgh, Amsterdam, Vienna, Budapest and Prague along the way. 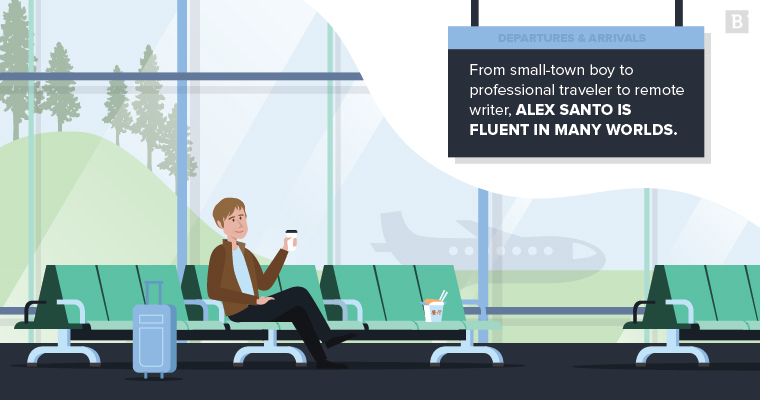 After China, Alex settled in Boston and started freelancing. He wound up excelling in ghostwriting romance novellas for small-press publishers. “After submitting my 20th novella about cowboys courting chaste country girls, I decided it was time to look for other work,” Alex said of the niche writing gig. Luckily for us, that’s when Alex walked through Brafton’s door. After submitting my 20th novella about cowboys courting chaste country girls, I decided it was time to look for other work. Alex has seen it all at Brafton – writing at the forefront of the most significant changes in the editorial team. He worked in the office for about a year before moving to California to write remotely. Sadly for us Boston folk, Alex never returned to the office and still works remotely full time – just in Washington state now. Working from home certainly doesn’t stop Alex from writing his heart out each day. “I’ve written about everything from artificial intelligence applications to managed travel programs, and just about everything in between,” he said. 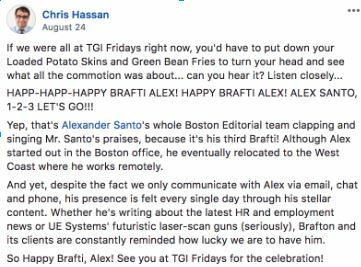 Alex just celebrated three years at Brafton – which we honored with a digital trip to TGI Fridays. Working remotely takes a whole lot of dedication, focus and time management – all qualities that Alex certainly doesn’t lack. “I’ve found that keeping a consistent schedule is key to working from home,” he said. Alex compares his nine-to-five day to the average Brafton writer: writing, researching and dialing in to meetings. I’ve written about everything from artificial intelligence applications to managed travel programs, and just about everything in between. “I’ve learned how to maintain professional relationships via an Ethernet connection,” Alex said. He says the collaborative nature at Brafton also makes his life easy as a remote worker. Alex’s top tip for working remotely? Setting boundaries. “Your family and friends will say they understand that you’re working, and then in the very next breath they will ask you to run to the store with them,” Alex joked. Along with ordering food in Chinese and writing about anything from romance to AI, Alex also understands the language of computers. To prove it, he’s currently building a new desktop PC himself. “I really enjoy finding the parts and putting them together to make a functional machine,” he said. Alex is also taking classes to learn Python. “Maybe someday I’ll be able to make an AI. I just hope it’s benevolent,” Alex said. Beyond that, Alex is also a self-proclaimed coffee snob, averaging about two to five cups of the good stuff each day – brewed with his Japanese-style Hario V60 for the smoothest finish, of course. If the fancy brews are fuel to keep him writing, collaborating and joking with such finesse, we have no complaints on our end.